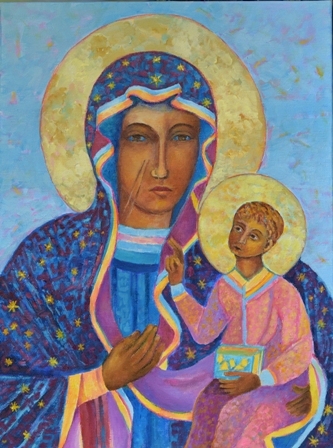 I painted my own version of this beautiful image of our Polish Black Madonna of Czestochowa. However, my version of this famous painting is based on the original old painting from the Jasna Gora Monastery. The shrine in Jasna Gora (in Poland) is one of the most visited Catholic pilgrimage site in the world. I love this Madonna and I love to paint Madonnas but using my own colors. This is not the exact copy, but is very similar and in more vivid bright colors.